So, you’ve launched several efficient marketing campaigns and spent forever optimizing store’s homepage? Does it appear like your efforts are finally beginning to pay off - customers are starting to regularly attend your e-shop, and make the long anticipated purchases? Well, good for you, but wouldn’t it be terrific to take extra advantages of your buyer’s interest? 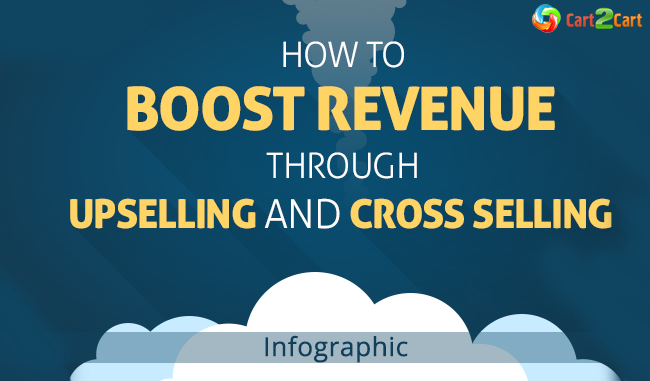 Today, we’ve decided to delve deeper into the common methods of increasing revenue from each single buyer, and show you a stylish Quick Sprout’s infographic that describes top progressive techniques of upselling and cross-selling. Enjoy. Despite the staggering potential of human persistence, it isn’t just e-merchant’s effort that matters when building tempting selling offers. Sometimes, an outdated shopping cart might limit your trading opportunities and, thus, curb your noble enthusiasm for improvement. So, if your current platform lacks important features for organizing effective upselling and cross-selling - it might be a good reason to think about changing it. At Cart2Cart we present a wide choice of supported carts to choose from, and permit e-merchants to migrate to them without spending much time or efforts. So, stop wasting any more time, register a new account, and equip your store with progressive functionality right now.